Solar energy-fueled DC microgrids are being installed in remote Himalayan villages that date back 800 years or more in India’s Ladakh state, bringing reliable, pollution-free electricity to residents for the first time. DC Microgrids have been making global strides as distributed energy, batteries, efficient loads, and electric vehicles have many rethinking the entire electric grid. 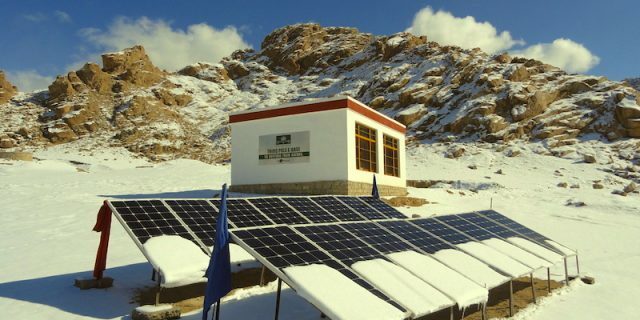 Engineers from the Global Himalayan Expedition (GHE) and volunteers from Infosys working under direction of the Kargil Rural Electrification Development Agency (KREDA) were able to get a solar DC microgrid up and running in the village of Itchu in less than two days, according to an India Today news report. The Indian IT outsourcing market leader is supporting the KREDA initiative financially and with human and other resources. The village’s solar DC microgrid is actually comprised of six smaller, interconnected microgrids, three 250 W and three 100 W sub-systems. Along with a lithium-ion battery storage system they produce and dispatch electricity for six LED street lights and 150 LED lights in homes and shops. Haji Gulzar Hussain, the deputy commissioner of Kargil district hiked for three hours some 10 kms to get to the village in time to commission the solar DC microgrid, which began dispatching electricity to 20 village homes Oct. 15. Adults and children alike were thrilled to see the village alight with electric power. Thanking the KREDA-GHE-Infosys project team, one 84-year Muslim woman who has lived her entire life in Itchu said that witnessing electricity for the first time was no less than an Eid (a Muslim holiday) for villagers, according to India Today. Hussain deemed GHE’s microgrid technology a new ray of hope for lighting villages throughout Himalayan India. Installing the microgrid in less than two days was a landmark achievement for the GHE team, according to founder Paras Loomba. ¨We are confident that DC-based microgrids are one of the most efficient and sustainable grid-based solutions for providing power in remote Himalayan villages,¨ he was quoted as saying. With funding from KREDA and corporations in India and overseas GHE intends to install microgrids and LED lighting in the Ladakh villages of Kargil and Zanskar in 2017 and 2018. Up in scale and far from the Himalayas, renewable and hybrid renewable microgrids also hold promise among India’s fast growing number of cloud data centers. Microsoft was the first to open not one but three Azure cloud data centers — in Chennai, Mumbai and Pune — last fall. Amazon Web Services (AWS) officially opened at least two cloud data centers in Mumbai in late June, with one February news report saying that Amazon had completed building five data centers in the city.